Sheet five of Franz Joseph’s Booklet of General Plans “blueprints” of the U.S.S. Enterprise from TOS Star Trek. Needless to say, this opened up a can of worms and the discovery that almost all the internal blueprints out there made a huge—and apparently erroneous—assumption about the basic number of decks within saucer. Most fan produced internal blueprints usually have eleven decks in total within the primary hull. Basically echoing the overall assumptions made with the old Franz Joseph’s Booklet of General Plans (the grandfather for Star Trek “blueprints”) of the U.S.S. Enterprise as seen in the original series of Star Trek (ST:TOS), which where originally created in 1974 for the Equicon ’74, and produced in 1975 and sold by Ballantine Books. Almost all the plans have the bridge as deck one, then two decks within the superstructure below the bridge, two decks between the superstructure and the two main decks that compose the main “disc” of the saucer, then four more decks as the saucer reduces down to the lower sensor dome area. 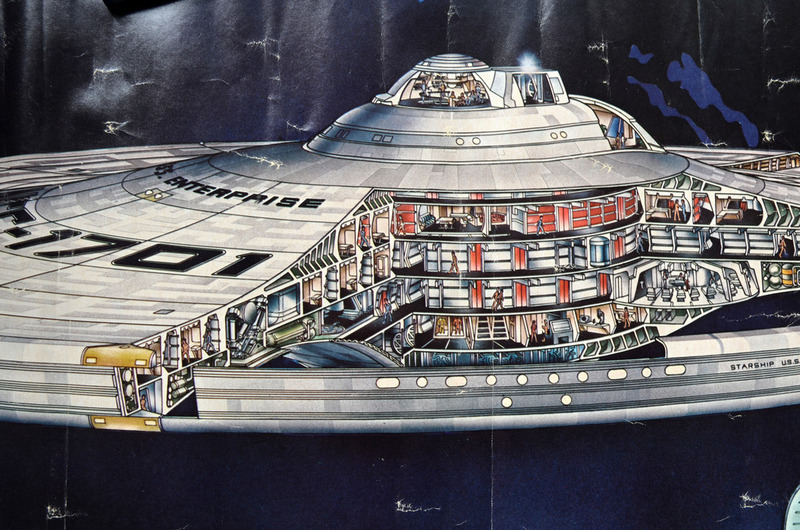 Though some fan-produced plans have only three deck and not four in the lower portion below the main “disc”, almost all of them however maintain seven decks from bridge through the lower deck in the widest part of the saucer. the refit-Enterprise before the bridge redesign. However going back over some Andrew Probert production sketches one in particular stood out. It was one where he was proposing a location for the rec. room deck within the saucer under the bridge superstructure—which tells a different story. 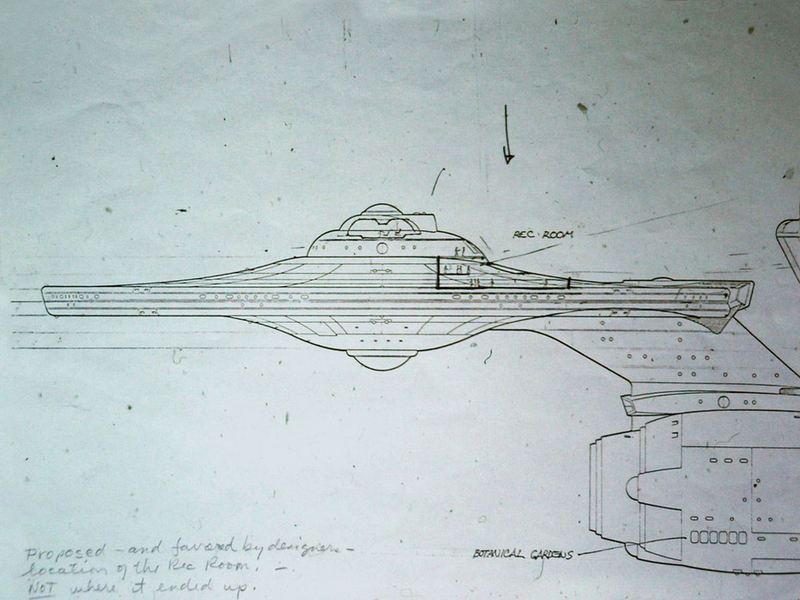 The sketch was done before the redesign of the bridge superstructure and the lower sensor dome were redesigned when Richard Taylor and the folks at Abel & Associates were still responsible for the VFX designs—which shows that the assumptions most people have about the number of decks, at least in the refit-Enterprise of Star Trek: The Motion Picture (ST:TMP) is wrong. In that drawing shows that there was originally only one deck intended to occupy the superstructure below the bridge deck shown above on the right. This is also confirmed in the classic ST:TMP cut-away poster drawn by David Kimble (who also inked the official “blueprints”) which was produced in conjunction with the film’s release. While many state that the poster is not “canon” (and indeed there are some minor errors in it) it does reflect the overall design thinking of the art department/design team at the time of the film’s release. refit-Enterprise as she is headed to her quarter’s. As an side, one of the minor errors in it is that it is clear from the film itself that the corridor where Commander Decker encounters Lieutenant Ilia as she makes her way to her quarters from the turbolift is deck five (as shown on screen) but is drawn as being deck four in the Kimble poster. That said, eliminating the need to try and force a second deck into the superstructure solves a myriad fit issues with deck spacing, turbolift shaft heights and clearances as well as window/portal arrangements in the saucer. Going with six decks in total (counting from bridge to bottom deck of the main disc before the narrowing taper) instead of seven allows an overall 3-meter internal deck framing that conformably accommodates the corridor framing as built on the Paramount soundstage. 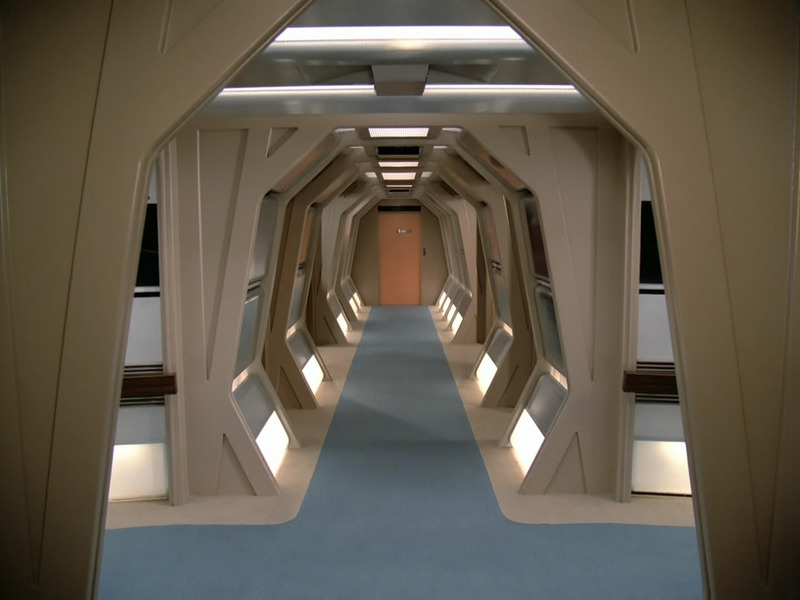 The “straight” corridor sections of course eventually being repurposed for the Star Trek: The Next Generation corridor sets. from Star Trek: The Motion Picture. The main problem it solves in the upper superstructure is it nicely resolves the problem of the fact that on the exterior of the filming miniature the portals around the inset alcove are pretty much equidistant vertically within the superstructure height. Trying to cram two decks into that space not only makes turboshaft stations highly problematic, but no matter how you fudge it, you end up with portals that are ether blocked by the deck itself, to sitting at the floor or at the top of the ceiling (depending on which way you fudge it. This solves that problem entirely, and allows the bridge to sit lower in the superstructure and will help make the twin turboshafts work better since they no longer need to come up as high into the bridge level structure. This entry was posted in Project Enterprise, Projects and tagged 2-3 Deck, Andrew Probert, B/C deck, Constitution-class, David Kimble, Enterprise-refit, Franz Joseph, Ilia, Lora Johnson, Mr. Scott's Guide to the Enterprise, primary hull, saucer, ST:TMP, ST:TNG, ST:TOS, Turbolift, Will Decker. Bookmark the permalink.